Titanium miner Kenmare Resources has said that production in three months to the end of March was "robust". In a trading update, Kenmare reported a 15% increase in Heavy Mineral Concentrate production to 358,700 tonnes, while it also saw a 13% increase in ilmenite production to 238,100 tonnes. 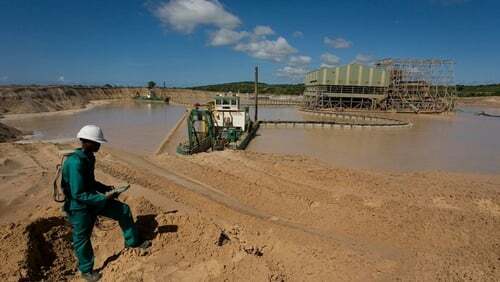 The company also reported a 7% increase in primary zircon production to 12,100 tonnes and said its concentrates production jumped by 80% to 10,100 tonnes as a result of the introduction of the mineral sands concentrate product. Kenmare operates the Moma Titanium Minerals Mine in northern Mozambique. It said it had a strong safety performance in the three month period with a lost time injury frequency rate of 0.08 per 200,000 man-hours worked - its lowest ever level. Its shipments were lower than anticipated - down 34% - due to poor sea conditions and the suspension of shipments for seven days due to the impact of Cyclone Idai as well as unplanned maintenance work. But the company said it remained confident that 2019 total sales volumes will not be impacted. "Titanium feedstock markets strengthened in Q1 2019 and we expect ilmenite prices to continue to rise in Q2 2019, driven by increasing Chinese demand," the company's Managing Director Michael Carvill said. He also said the company was "deeply saddened" by the devastating effect of Cyclone Idai on the people of central Mozambique and commended Kenmare's workers' collective initiative to support the relief effort.